An old Chinese proverb says, a wise man never stops learning. The staff at Beaches Resort and Spa have been taking this saying to heart, creating an environment of learning that knows no bounds. They proved that this Monday when more than 100 members of their team graduated with various certificates and diplomas. It is clear to see that many motivated employees have taken advantage of the opportunities available to them. This year, members of the team graduate with professional certificates, diplomas and degrees. They include: 41 learners with Bachelor Level 2 Certificate; 16 with a Level 3 Diploma; 26 with Professional Associate degree; 19 with a professional Bachelor degree and 13 with a professional Master degree. The programme is a wonderful benefit to both the employer, who gets more highly skilled and motivated staff but also to the employee who extends their credentials and opens doors for themselves that might not otherwise exist. D’Kandro Bain a team member from the entertainment department who graduated with a professional Bachelor level 2 Certificate said: ‘I’m grateful for the opportunity to achieve something for myself personally and to be able to grow in the hospitality and tourism Business’. Beaches Turks & Caicos graduation, 21 July 2009. Pictured above is the BL4/BL5 group completing BL2. Beaches Turks & Caicos graduation, 22 July 2009. Pictured above is the ML5 group completing ML3. 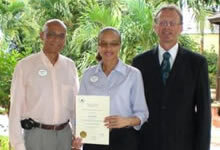 Profiles the review and graduation events held for 115 team members, supervisors and managers following professional Bachelor and Master pathways at Beaches Turks & Caicos Resort & Spa and additionally, the briefings held at Sandals Royal Bahamian, Nassau, the Bahamas.